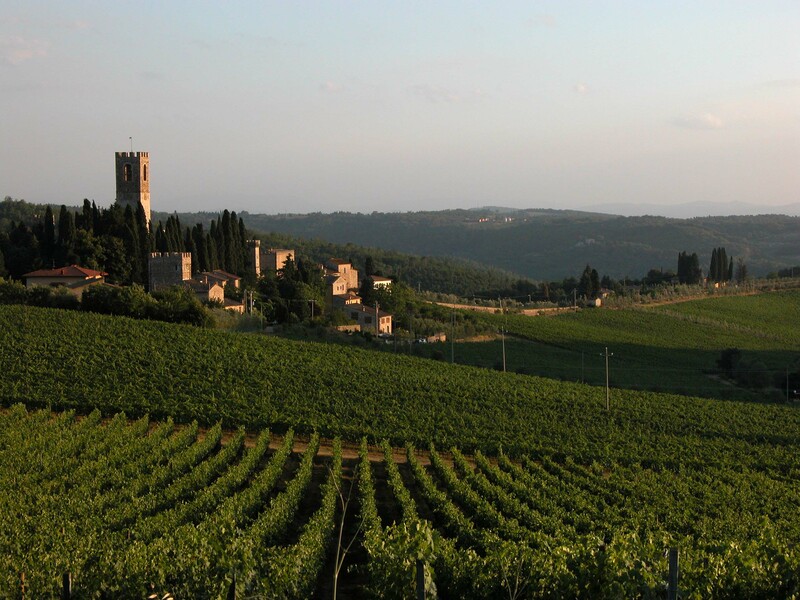 Barberino Tavarnelle is located in a fortunate position halfway between the Val d’Elsa and Val di Pesa. Despite being in Chianti, it is slightly off the usual tourist tracks, which makes it perfect for those wishing to explore a more authentic, uncrowded Tuscany with places worth discovering and stories worth knowing. The old centre of Barberino keeps intact its medieval structure, with its Florentina and Sienese gates and its defensive towers overlooking the Drove valley. The story started in the early 1200s when the Florentines destroyed Semifonte in 1202 and used Barberino - due to its uphill position - against the landowner allies of the empire. Today, in commemoration of Semifonte, at the top of the hill, stands a temple consisting of a cupola just like Brunelleschi’s in Florence, but eight times smaller. Isolated in the countryside but not far from the center of Barberino, it’s certainly worth visiting the evocative basilica of Sant’Appiano. The Santa Maria a Marcialla church, on the other hand, conceals a wonderful mystery: one of the side altars is topped by what is traditionally deemed to be a fresco painted by Michelangelo in his youth. The style could resemble that of the great Renaissance artist and, to deepen the mystery, beneath a marble slab by the altar you can still see some initials bearing the intertwined letters MBF, for some the young Buonarroti’s tag (make sure you ask the priest’s permission before moving the stone). Tavarnelle has been for a long time the rest stop along the “via regia” which once linked Florence and Siena (and therefore Rome). The area is enriched with a high number of churches and parish churches that boast a wealth of artwork. The Church of Santa Lucia al Borghetto, an ex-Franciscan convent, is home to an Annunciation by Neri di Bicci. Not far from Tavarnelle, in the hamlet Morrocco, you can visit the Church of Santa Maria del Carmine and in the rectory of the centuries-old Romanesque Parish Church of San Pietro in Bossolo is the Sacred Art Museum, home to works like an important series of panel paintings made in 1473 by Neri di Bicci. But what is probably the highlight of the area is the imposing Badia a Passignano, founded in 1049 by Vallombrosan monks. Immersed in the countryside and surrounded by a strong cultivation of olives, the abbey is striking for its fortress-like appearance, complete with walls and crenelated towers. Amongst the numerous works of art conserved here are the frescoes by Passignano (1601) in the church’s main chapel and the Last Supper, frescoed by Domenico and Davide Ghirlandaio (1476-77), in the monastery’s refectory. Take a walk in San Donato in Poggio, a medieval village that conserves important ruins of its defense walls, the Renaissance Palazzo Malaspina, the Gothic Church of Santa Maria della Neve (from the 15th century) and the Parish Church of San Donato, which conserves a beautiful baptismal font in glazed terracotta by Giovanni della Robbia. Lastly, don’t miss the “Emilio Ferrari” Museum of Rural Life, where you can retrace the history of rural civilization in the Chianti. A fascinating place, rich with culture, nature and typical products.